The Profile Theme has received a major update. We have reconstructed the theme from scratch. As a result, the design, code and options have been drastically improved. The theme is ready for Gutenberg and the future of WordPress. The Profile Theme is perfect for individuals in need of a professional online presence. Whether you’re an event speaker, consultant, personal trainer, or work within any industry where YOU are the biggest commodity of your business — Profile is designed to meet your needs. It provides your clients with several ways to reach you and connect to your social networks. A social media menu can easily be added to your home page and the website footer. Simply navigate to Appearance > Menus in the WordPress admin, and create a new menu. Then, add custom links to your social media profiles. Choose to display your new menu in the “Social Menu” location, and voila! 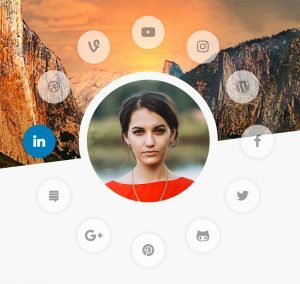 The social media links will automatically display in a circular design around your profile image with the correct icon — like magic! The Twitter feed is a cool feature of the Profile Theme! It can be displayed on the home page template beneath the header. The feed is continuously updated to display your most recent tweet. Setting up the feed is as simple as navigating to the WordPress customizer, and entering your Twitter username in the theme options. 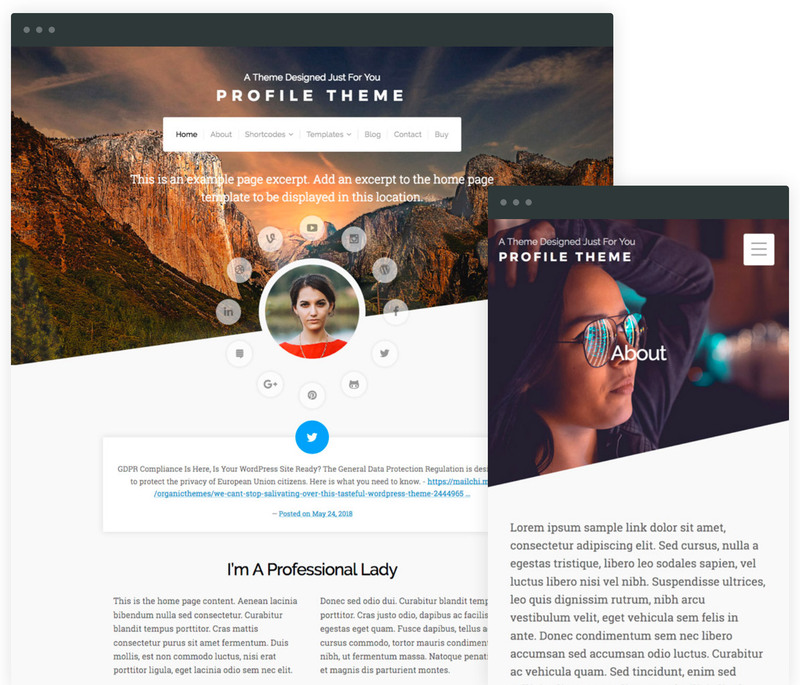 The Profile Theme features the new WordPress custom header video option. A YouTube link, or uploaded video of your choosing can be added within the WordPress customizer. As a result, your video will display as background footage behind your menu and profile image. It’s perfect for adding that extra “Wow!” factor to your website. The Profile Theme has been integrated seamlessly with the latest version of WooCommerce. As a result, adding a shop to your personal website is a piece of cake! WooCommerce has undergone a number of changes since being acquired by WordPress. The plugin has been updated to include options within the customizer. So, you can setup a shop while customizing the appearance of your theme. The result is an intuitive interaction between the plugin and the theme. Our Organic Customizer Widgets plugin has been steadily growing in popularity since its release. With over 8,000 active installs and raving reviews, customers are seeing the merits of a simple WordPress page builder. The plugin is designed to use custom widgets and the WordPress customizer for building dynamic pages. As a result, you can easily display slideshows, testimonials, team members, portfolios, and more on any page! The latest version of the Profile Theme has been designed to work with the Organic Customizer Widgets. So, the possibilities for page design are endless! WordPress 5.0 and Gutenberg are just around the corner. It’s important that our themes are compatible with the upcoming version of WordPress. The latest version of the Profile Theme is designed to work seamlessly with Gutenberg blocks. With all the new updates, the Profile Theme is relevant once again. Use it for your personal profile website today!